Before I started this...well what I am calling a journey, I intentionally decided not to look up the teas that I might encounter. This way I have a delightful surprise to look forward to each day and one that I can share with everyone. When I opened up my door for December 2nd, I was happy to see that this journey appears to wander into the realms of different style teas as well as herbal infusions. Our tea today is Vanilla Rooibos. Hmmmm. Gingerbread and Vanilla. Am I seeing a trend? Now I have always enjoyed rooibos which has a lot going for it. First of all, it is naturally caffeine free which makes it a nice treat in the evenings. And it has pleasant nutty flavor. The downside is that the blends are usually so fine that they make a mess of my teapot. And I hate to say that it is a pretty big downside so I typically don't have any in stash. I think that is about to change. 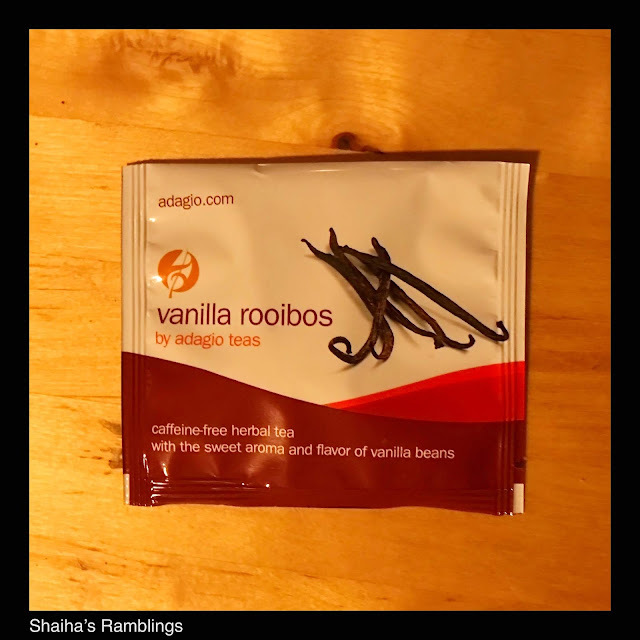 This infusion has a light nutty taste along with a delightful vanilla flavor. And best of all is the fact that is all nicely packaged together is a nice pyramid sachet! No mess, no muss. I think that a box will find its way to my tea stash. Be sure to pop by tomorrow for the next step in our tea journey.